(Rue Anemone (Thalictrum thalictroides or Anemonella thalictroides) - 01) This small patch of rue anemone was growing on the edge of the woods. 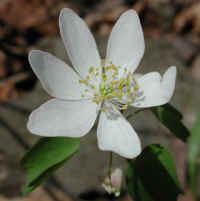 The rue anemone has become relatively rare, and perhaps endangered, because of over-picking or from being killed during construction and human developmental activities. 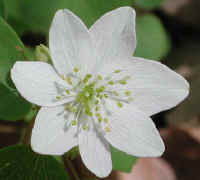 (Rue Anemone (Thalictrum thalictroides or Anemonella thalictroides) - 01a) One of the key identifying characteristics of the rue anemone is the leaf structure. Each roundish leaf has three lobes on top and two where the stem is attached. The literature says that three leaves form a whorl from a solitary stock. 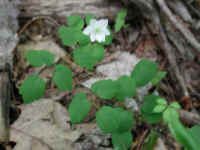 In this photo, we believe that there are six leaves and three flowers in the whorl. This whorl emanating from the top of the stalk causes the leaves and flowers to tremble in the slightest breeze. 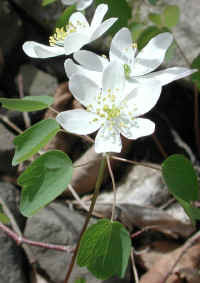 This led to the rue anemone's common name "windflower". The name "anemone" is derived from the Greek word for "wind". 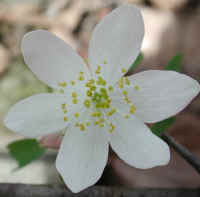 The rue anemone grows to heights of from four to eight inches. 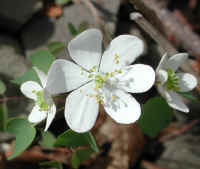 (Rue Anemone (Thalictrum thalictroides or Anemonella thalictroides) - 02) The flowers of the rue anemone vary in size from slightly under 1/2 inch to nearly 1 inch across. This particular flower was about 1/2 inch across. 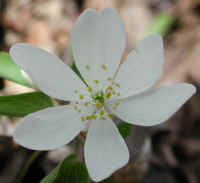 It has from 5 to 10 petal-like sepals, and no actual petals. 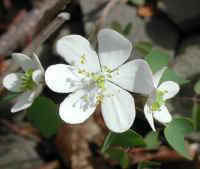 The rue anemone in this photo has 7 sepals. 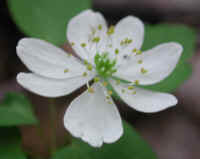 (Rue Anemone (Thalictrum thalictroides or Anemonella thalictroides) - 03) The literature says that the rue anemone has numerous stamens and pistils. While we agree that there are numerous anther-tipped stamens, there appear to be only three pistils (note the roundish white openings at the top). 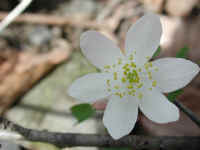 Just as the number of leaves, sepals, and flowers vary, so may the number of pistils vary. 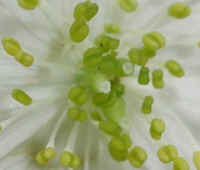 (Rue Anemone (Thalictrum thalictroides or Anemonella thalictroides) - 04) This is an enlarged photo of the center of the flower of the rue anemone, which more clearly shows the formation of the stamens and pistils. 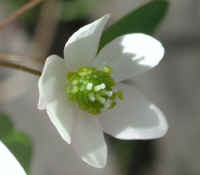 The three whitish open-topped structures in the center are the pistils. The swollen portions below are the ovaries, the duct is called the style, and the open top is called the stigma. 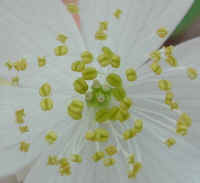 Around the pistils are the stamens. 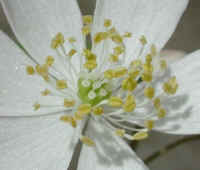 The stock portion of the stamen is called the filament, and the pollen coated top is the anther. The seemingly infinite detail of God's creation is a wonder to behold! (Rue Anemone (Thalictrum thalictroides or Anemonella thalictroides) - 05) Some of the cell structure of the rue anemone sepals are visible in the enlarged photo. The slightly marred tip of the sepal is where they are attached to one another at the tip of the bud before the flower opens in April, May and June. (Rue Anemone (Thalictrum thalictroides or Anemonella thalictroides) - 06) We spotted this rue anemone growing along the side of the road in early spring. (Rue Anemone (Thalictrum thalictroides or Anemonella thalictroides) - 07) The rue anemone flower may sometimes have a slightly pinkish color on the underside. (Rue Anemone (Thalictrum thalictroides or Anemonella thalictroides) - 07a) This is a close-up view of a one inch diameter rue anemone flower. (Rue Anemone (Thalictrum thalictroides or Anemonella thalictroides) - 07b) This is a bee's eye view of the stamens and pistils of a rue anemone flower. 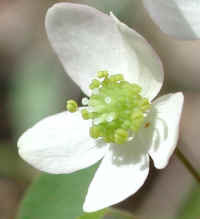 Four pistils can be seen in the center surrounded by numerous stamens. 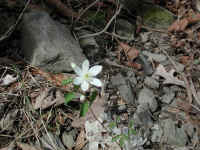 (Rue Anemone (Thalictrum thalictroides or Anemonella thalictroides) - 08) This rue anemone had one damaged petal. (Rue Anemone (Thalictrum thalictroides or Anemonella thalictroides) - 08a) This rue anemone flower has at least 6 pistils in the center. 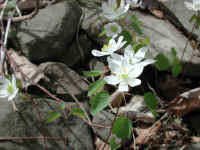 (Rue Anemone (Thalictrum thalictroides or Anemonella thalictroides) - 09) This is a rue anemone that we found growing in the woods in the early spring. 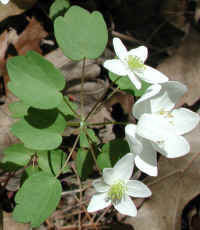 (Rue Anemone (Thalictrum thalictroides or Anemonella thalictroides) - 10) When rue anemone plants are mature, they will reach heights of 4 to 8 inches, but in early spring, they may be shorter. 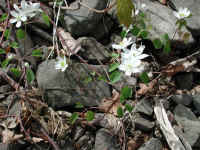 (Rue Anemone (Thalictrum thalictroides or Anemonella thalictroides) - 11) This beautiful patch of rue anemone was growing up through the rocky ground. (Rue Anemone (Thalictrum thalictroides or Anemonella thalictroides) - 11a) The quiet beauty of God's creation can seen in this rue anemone. 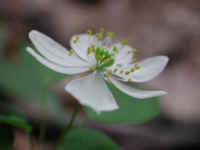 (Rue Anemone (Thalictrum thalictroides or Anemonella thalictroides) - 12) This is another look at the delicate beauty of the rue anemone. (Rue Anemone (Thalictrum thalictroides or Anemonella thalictroides) - 13) These rue anemone flowers are in various stages of development. (Rue Anemone (Thalictrum thalictroides or Anemonella thalictroides) - 14) This is a close-up look at a newly opening rue anemone flower. In this photo, we can also clearly see the 6 central pistils that are surrounded by the emerging stamens. (Rue Anemone (Thalictrum thalictroides or Anemonella thalictroides) - 15) This is a close-up look at another newly opening rue anemone flower. (Rue Anemone (Thalictrum thalictroides or Anemonella thalictroides) - 16) We spotted this rue anemone growing in a wooded low land area near the Murdererskill. (Rue Anemone (Thalictrum thalictroides or Anemonella thalictroides) - 17) This is another look at this rue anemone with 8 petal-like sepals. 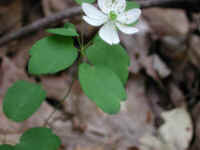 (Rue Anemone (Thalictrum thalictroides or Anemonella thalictroides) - 18) This is another look at the rue anemone. 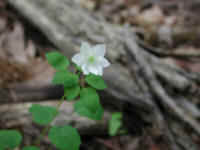 (Rue Anemone (Thalictrum thalictroides or Anemonella thalictroides) - 19) This is another look at the rue anemone. 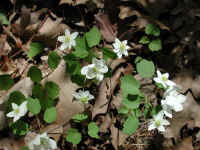 (Rue Anemone (Thalictrum thalictroides or Anemonella thalictroides) - 20) Previous, we had questioned whether or not the term numerous was accurate for describing the number of pistils, but as we can see in this photo, there are many. 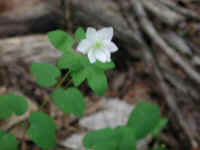 (Rue Anemone (Thalictrum thalictroides or Anemonella thalictroides) - 20a) In trying to get a more accurate count of the number of pistils that this rue anemone has, the photo got a little fuzzy, but we can still see that there are 12 pistils, so the term "numerous" is appropriate. 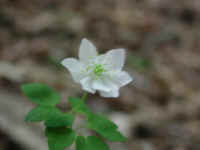 (Rue Anemone (Thalictrum thalictroides or Anemonella thalictroides) - 21) This is a side view of a rue anemone flower. 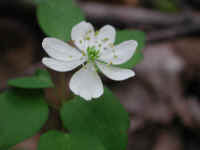 (Rue Anemone (Thalictrum thalictroides or Anemonella thalictroides) - 22) We normally don't see rue anemone this tall, but the wildflower does have the same leaves and flower.